Philippians 2:5-11 is traditionally associated with the doctrine of the Trinity. However, I think the context suggests that Paul’s main point is not to teach the doctrine of the Trinity. From an interpretative standpoint, I believe the context suggests that Paul intends to teach something about unity and our attitude towards other believers, and he uses Christ as an example to make that point. If we also learn something about the Trinity, that is icing on the cake. Paul imprisoned in Rome around 60-62 AD, waiting to see whether he will be released or executed. The Philippians church has generously sent him financial support. Paul is writing this letter to thank them and send them news. In chapter 1, he expressed his gratitude for their faith that led them to support him financially and he told them he is praying for their spiritual health. He prayed that they would have a genuine faith that manifests itself in wisdom which leads them to love one another and that they would persevere in this faith until the end. In spite of his circumstances, he rejoiced that the gospel was progressing even though he was not free to proclaim it himself. Philippians 1:27 the first major section of the body of the letter which continues through the end of chapter 2. Paul urges them to stand firm in the face of persecution and remain united in their thinking, purposes and faith. He wants them to be unified around their fellowship in the gospel and to have the kind of unity that results from being committed to the same things. Philippians 2:5-11 is sometimes referred to as “the Christ Hymn” because it has a poetic structure. It is a famous passage, but we sometimes lose how it functions in the context of this exhortation. However, there is widespread agreement that Paul’s main point is that we should have the same humble attitude that we see in Jesus. Or the man Jesus was the perfect, complete representation of God; he was equal with God in the sense that he has the same authority and the same character and the same values and so forth. We are not asking which option is theologically true. Both statements are true. The question is: which one does Paul mean in this context? If Paul mean means the second option, he would be saying, the man Jesus submitted to a single humbling. As a man, he lowered himself to take the role of the servant. Notice that both options agree about Jesus experience as a man and that Paul’s main point is his experience as a man. Consider this sentence: “Walking to the store, I found a dollar on the sidewalk.” The main clause is “I found a dollar on the sidewalk because it stands alone as a complete thought. “Walking to the store” is a participle that modifies the main clause. It describes the circumstances in which I found the dollar. In both cases I have this participle phrase “being a democrat”. Both cases modify my vote. But the connection between them is different. In first example it means in spite of the fact that I am a democrat I voted a certain way. In the second example, it means because I am a democrat I voted a certain way. Clues in the context explain the connection. 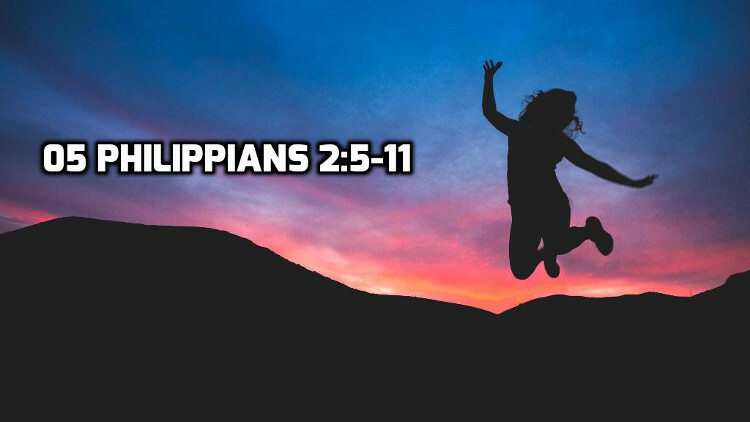 Philippians 2:5-11 contains 3 main clauses and 3 participle phrases. The 3 main clauses give us a clear picture of Paul’s main thought: Jesus did not count equality with God a thing to be grasped. Jesus made himself nothing. Jesus humbled himself and died in our place. No matter how you understand the modifying participle phrases, we see an essential relationship between Jesus being a servant and Jesus being a man. You can’t be the kind of servant Jesus was without being a man. In 2:9-11 that God goes on to exalt Jesus not merely for who he is (the incarnation of God) but especially for what he has done. Paul’s main point in context then is: If Jesus the Lord and master sacrificed himself for us, than that is the attitude we should strive to have toward each other.